"The fact is that the secret of great praying has nothing to do with human effort or skill. Plenty of people would like to think it does because they want to make prayer and achievement. They want to be able to think of themselves as great pray-ers. 1. God the Father loves to hear us pray. 2. God the Son makes every prayer pleasing to God. 3. God the Holy Spirit helps us as we pray." The words were like a thunder clap in my heart. I've written before about how praying is somewhat difficult for me and I'm always looking for good teaching and inspiration on how to pray more consistently and more devotedly. Setting aside time to pray and/or creating a check list of How to Pray for Things in Proper Order has always felt so hopelessly unattainable. I breathe prayers like, "Dear Lord, help me make it through this day" and the like but nothing that I feel is very profound. And yet, at the same time, I always feel as if I've been heard and that an answer is there for me to see immediately or discover later. I've no doubt that I'm heard but I have every doubt that I sound like an ignorant child with elementary theology. I feel like I can never measure up and that I'm failing even as I'm beginning to voice my thoughts. This produces further discouragement and although I tell myself that I still need to voice something to the Lord, that it is never going to be good enough and I'll just have to "give an answer" for my undisciplined prayers someday in the future. It almost sounds ridiculous once I type it out but I feel like judgement awaits for my lack of beautiful prayers. Comparatively speaking, I'm low on the totem pole when it comes to beautiful prayers. Enter You Can Pray . In one simple paragraph I found joy in praying that I have never known before. No, my prayers are not any more beautifully worded and I haven't sweated any blood. It's more that I know that my prayers are pathetic but that I have also been released from guilt with the reminder that Jesus has already closed the gap between my faulty prayers and God's holiness. The Holy Spirit does His part as well by providing that instant connection to the Father which I have always felt but which has led to the aforementioned guilty feelings. I am assured that He is listening, He wants to listen, and that I ought not be embarrassed at the thought of what He must be enduring when I address Him directly. Quite simply: He wants to hear from me and, again, He has already bridged the gaping wide chasm between us. I can approach Him with my humble, silly language because of Jesus. Because of Jesus I can pray; because of Jesus, I am heard. Because of Jesus. It really doesn't have anything to do with my amazing praying skills (of which I have none). Now, neither Chester or I have any interest in suggesting that we can go about doing or saying whatever we please in the name of grace and Christian liberty. Let's not swing too far afield. We are still required to pray. God asks it of us. The point being though that we should not avoid it because we think that our ability to commune with the Lord has anything to do with our perceived abilities. I don't need to worry about "thees" and "wherefore art thous" or using six to eight letter words to address God. I do not need to pray in a particular pattern to be heard and I do not need to set a timer for holiness. I can breathe out my prayers and tell Him what I'm thinking/feeling/struggling with, etc., and know that Jesus' work on the cross had performed the miracle which allows me to connect. To repeat, it has nothing to do with me. To put this all a different way, reading this one paragraph in You Can Pray gives me permission to pray without fear of damnation for my lack of ability. I can just....pray. Just as I am. No fear of judgement. There is now only the satisfied feeling of knowing I am being heard because the Lord is greater than me. God wants to hear me pray and so He made it possible in and of Himself for me to do so. The gift of prayer is mine because of grace freely given. I do realize that all of the above isn't exactly mind blowing information. But at the same time, it is. It is freedom to my soul. It is gladness to choose to speak to God at any point in time I wish with a joyful, cheerful feeling about me, knowing that His perfectness ignores my imperfections. I am not being graded; I am being loved. This is profound for me. It is a most freeing message. I can pray. And so can you. Anytime, any place, with any language you have available to you. Your imperfections are overlooked in light of His perfections. Prayer is a gift and I now, for the first time ever, gratefully receive it. I can do nothing but recommend this book. 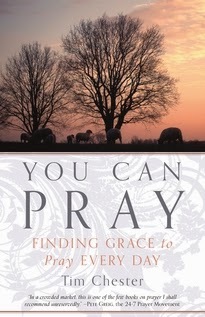 If you struggle with prayer at all, I suggest this title to you. Many thanks to P&R Publishing who sent a copy of this book my direction in order to facilitate this review. I received no additional compensation for this post (even thought that seems the stupidest thing in the world to type out) and all opinions are my own. The gratefulness is real. Good thoughts--I'm glad for how it spoke to you. I used to feel guilty about not retaining more from nonfiction books until I came across Piper's quote. Often it is just a thought or sentence or concept from a book that stays with me. I don't think I ever wrestled with this particular issue - I knew praying was a matter of talking with God as a child talks to a father and didn't need to be in any certain form to be acceptable. But I am so glad the truths in this book gave you that sense of freedom. I used to feel like something hadn't been officially prayed for unless I had prayer about it during my devotional time. But then somewhere along the way I realized that when someone shares a prayer request and I pray for it immediately, that "counts." :-) That gave me a sense of freedom - I didn't have to assemble giant lists and spend hours in prayer. I like how you emphasized balance, and I had to be careful about that even in this. Sometimes I am talking with God off and on through the day but then neglect having some concentrated prayer time. I liken it to my relationship with my husband. There may be a few days where we just touch base here and there through the day, but sometimes we need to set other things aside and just spend time with each other. I always feel like my prayers are so far from what they should be. My church family recently had an afternoon prayer/singing service, and one of the men mentioned that if we ever feel like we've prayed a great prayer, then we've did it wrong. Yup. That trips me up too. Thinking I have to be a good pray-er. Thanks for this encouraging post. This sounds like a great book.